The need for highly competitive designs meant that solar thermal had not had much of a chance within the SDE+ programme until the end of 2015. Most of the scheme budget used to be spent on biomass, geothermal and on-shore wind projects. In 2016, the average market price of solar heat fell (widening the gap to be bridged by subsidies), SDE+ funding was increased and biomass co-firing in coal power plants was dropped from the list of eligible technologies, which has greatly improved the chances of solar thermal. Last year, the most important competitor of solar heat was PV. Spring of 2017 marked the application round for PV plants at a base amount of 12.5 EUR cent/kWh (solar thermal: 9.5 EUR cent/kWh), so they rank after solar thermal if the budget gets tighter. In 2016, SDE+ approved funding for around 62 MW in solar thermal plants. Many applications were about heating systems for orchid greenhouses, where the collectors come from Dutch importer Zonneboilerpro. The first of these systems Is now under construction. Lex Bosselaar, who works at RVO.nl and used to represent the Netherlands within the IEA Solar Heating and Cooling Program, views this first system as critical for others that could follow: “The development of this new market will depend a lot on the performance of the first systems,” he said. Not all projects for which funding has been approved will be realised. The SDE+ budget is financed by a levy on electricity prices. If there are funds left, they will be made available for other projects or used to reduce the charge added to electricity costs. 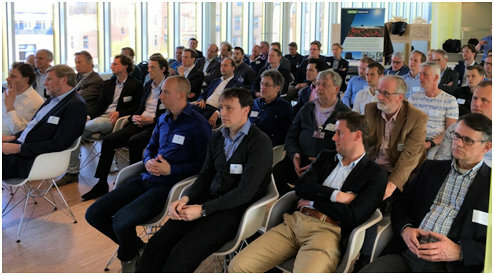 Stakeholders of the district heating market have been the second group besides agricultural businesses to take a closer look at solar thermal energy use in the Netherlands. The subsidy amount of 6.6 EUR cent/kWh could make SDH a very attractive option for district heating companies (see the calculation model below). “The solar plants themselves could be built in the Netherlands at costs similar to those in Denmark. The key factor will be the price of land – which might be higher here,” said Bosselaar. He expects that energy producers and system suppliers will start making efforts to identify suitable applications for solar heat, so more markets can emerge. The SDE+ programme is said to have two application rounds in 2017. The first from 7 to 30 March saw applications for 27 solar thermal projects totalling 26 MWth. Expectations are that most funding requests will be approved, as the amount asked for in these applications was only slightly above the budget available. Competition among renewable technologies is an integral part of the SDE+ concept: There is only one budget for all types of renewable energies. There has also been a maximum tariff specified for each technology to reflect differences in the cost of production. In the case of solar heat, it was 9.5 EUR cent/kWh during the application period in spring 2017. Producers of solar heat can choose for which tariff amount they apply, as long as it does not exceed the maximum for their technology. However, the incentives are only meant to bridge the gap between market and production price, not to pay for all costs associated with renewable energy generation. A “correction amount” is applied to take into account the market price of the energy produced. It was set to 2.9 EUR cent/kWh of solar heat in spring 2017 and will be adjusted if the situation on the market changes. Based on currently available figures, producers of solar heat can expect an incentive of, at most, 6.6 EUR cent/kWh. Full-load hours of solar thermal plants are capped at 700 per year, which means a maximum annual subsidy of EUR 6,468 at 140 kWth of capacity. The subsidy is paid over no more than 15 years. One year after the project application has been approved, the energy producer must submit documents detailing the planned installation, for example, which components will be part of it and what the construction contracts look like. The plant must then be up and running in three years’ time and the energy producer must register with certification body Cert iQ and be listed by a metering company as a producer of renewable heat. After meeting these requirements, a monthly instalment will be paid in advance. The correction amount will be adjusted annually based on certified metering data and the actual energy price.